There is NOTHING WORSE than a sidepiece that doesn’t follow instructions. So… Group messages can be a little tricky. You need to make sure whoever you include in a group text, is a willing participant and no one will get offended by any other recipient included in the text. When I publish a new post, I send out group texts to notify my contact list of the post. I do so in alphabetical order but as you can see above, my BFF did not want to be included in the same group message as another one of my contacts. In this case, my BFF responded to me in the group text and the “unwanted” party (and everyone else included in the text,) was able to see what was said. The “unwanted” party then responded and things got uncomfortable. Hilarious but uncomfortable, none the less. 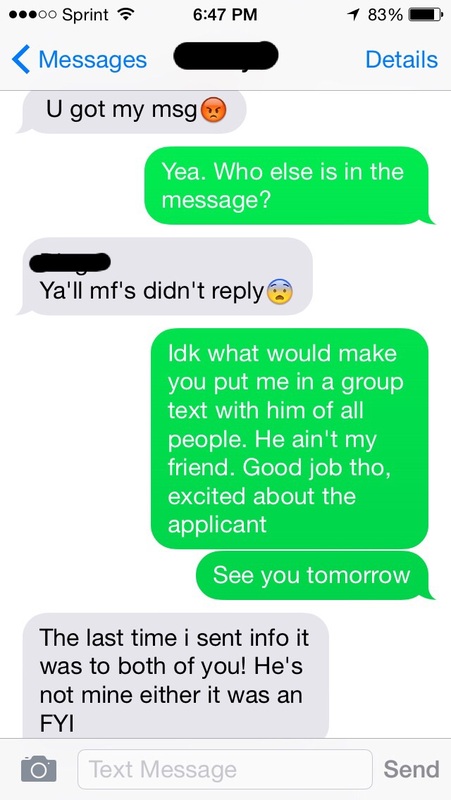 Below, you will find an example where I was placed in a group text by someone (for the second time) and the other participant in that text was someone who did not have my phone number and I was not comfortable with them having my phone number. (I’m weird like that) If someone is going to have my cell phone number, let me offer it, don’t just randomly volunteer it because you’re too lazy to copy and paste to send the text separately! Ugh. Lesson here: Group texts should be carefully considered before pressing “Send.” The damage they do is irreversible.